Leg rest pillows are designed to let you raise your legs comfortable and effortlessly and hold them in a position to treat various conditions. Your doctor may recommend a leg rest pillow to treat varicose veins or phlebitis. Leg rest pillows are separate from knee pillows that let you sleep comfortably on your side while pregnant or suffering from sciatica. Leg rest pillows may ease back pain or prevent your partner from being bothered when restless leg syndrome kicks in. Here are the top 7 best leg rest pillows on the market. This leg rest pillow is made from dense foam that won’t flatten over time like some of its rivals; it isn’t made from memory foam, though that’s how the manufacturer describes it. The pillow comes with a removable, machine washable cover, making it easy to maintain. It has a very wide platform that lets anyone use it. It fits everyone. It is lightweight. The wedge on one side is combined with a large flat surface for resting your legs on, and it means you could use the front half of the pillow as a wedge pillow in a pinch.This is an affordable alternative to a shape adjusting bed that costs thousands of dollars. This leg rest pillow was designed by a board certified vascular surgeon and is patented. This explains its somewhat higher price. If you need a uniquely contoured pillow of specific proportions to offer exactly the right degree of support and positioning, this is the leg rest pillow for you. It is available in sizes from small to tall, so it is ideal for those who don’t quite fit on the standard leg rest pillow. It is available in blue and deep brown. It is reasonably dense foam, but it isn’t as soft as memory foam. Use this pillow for sleeping at night but not 24×7. Are you attracted by the Lounge Doctor’s design but need something softer because you need your legs elevated 24×7? That might be because you’re on bed rest due to pregnancy and blood pressure concerns require you to have your legs elevated all the time. Or you’re recovering from joint replacement surgery and need the leg elevated nonstop for several weeks. You want the right degree of support and pressure, but that may not be the same degree day after day. 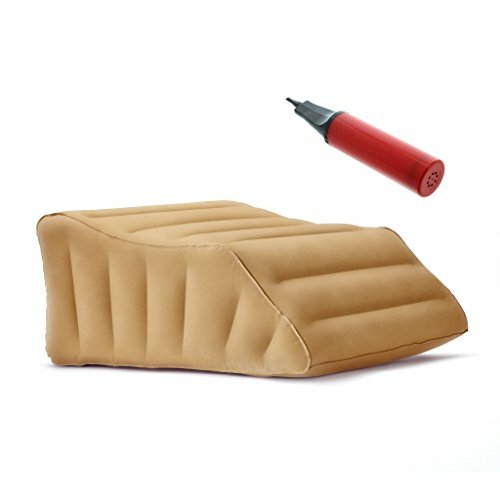 In comes the Lounge Doctor inflatable leg rest pillow. It comes in small, medium and large sizes. A compatible air pump comes with this model. And unlike other leg rest pillows, you can deflate it and take it with you. The Zero Gravity brand leg rest pillow comes in two different sizes, small and large. It is available with blue and white polyester covers. The biggest attractions are the low price and the fact that it is made in the United States by a company with a fifty year reputation for quality. It is wide enough for both legs. It isn’t going to work if you’re a side sleeper. It is durable enough to continue working after months of continual use. We mentioned several other leg rest pillows that offer excellent support but have very dense foam that makes them unsuitable for those who need memory foam. The Deluxe Comfort brand leg rest pillow is the best leg rest pillow for those who need the soft touch of memory foam under a sore or injured leg. This is a one size fits all pillow, so if you’re shorter or taller than average, it won’t work for you. It is affordable, but if you don’t like it, you have to pay shipping to send it back. Leg rest pillows may be needed permanently after a diagnosis of edema or for an extended period of bed rest such as during a high risk pregnancy. However, there are times when you need just one leg elevated, whether due to an injury in that leg, leaving it in a cast, or a single joint replacement. 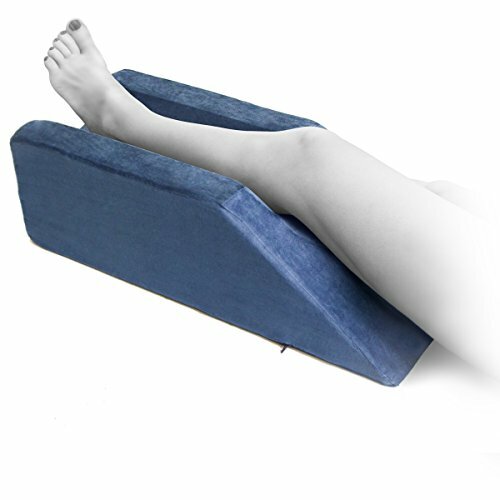 The Milliard leg rest pillow is just what you need when only a single leg needs to be elevated. You can use it for either leg. It comes in just one size but fits almost everyone.The channel in the middle of the pillow prevents your leg from slipping if you move. It comes with a machine washable cover. The ProCare brand leg rest pillow is similar in price to the Milliard pillow. It shares the same open grove design perfect for keeping one leg elevated per doctor’s orders. It doesn’t have a washable cover; instead, you can wash or sterilize the entire pillow as if wiping down a counter. If you have ulcers or stitches on your leg, this pillow is the better choice, since you need to actually sterilize the entire thing. If you’re dealing with a foam pillow, anything that seeps through the cover becomes a literal health hazard. The ProCare leg rest pillow eliminates that risk.